Out of the Jungle - started by Jim Milles, written by contributors Betsy McKenzie, Marie S. Newman, Jacqueline Cantwell and Meg Kribble. And of course there are many friends behind the other blogs mentioned, too. Congratulations, everyone, for the mention! Connie thanks for the mention. I've got absolutely no idea how I managed to make it on this list. 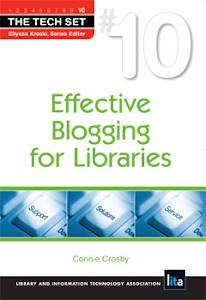 I can think of several other UK Law Librarian Blogs which deserve to be on here! Don't question the mysterious ways of the top blog list--just enjoy it and the new traffic!